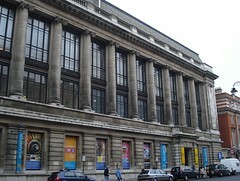 Large museum of science in South Kensington, with both permanent and temporary galleries. On the ground floor, the permanent Making The Modern World gallery displays "exceptional objects" which signify events that changed the world, including the actual Apollo 10 command module that went around the moon. In January 2010, around the balcony on the second floor was a display of postwar innovations, with technical, military, and architectural advances displayed on one side and domestic items (teasmades, televisions, etc) on the other. Signage was a little confusing on the technical side of this; the descriptions weren't always next to the thing they were describing. There was also a nice little Dan Dare themed area between the two sides of this gallery. The permanent mathematics gallery, also on the second floor, is a little retro-feeling; there are some interesting models of mathematical surfaces but they're behind glass so you can't pick them up and turn them over to get a feel for them. Similarly, the slide rules and pantographs are just for looking at, rather than being accompanied by usable replicas. The (also permanent) computing gallery has (as well as half of Charles Babbage's brain in a jar) a huge valve computer that is actually the world's oldest working computer — a 1956 Ferranti Pegasus. Launchpad, the interactive area on the third floor, is aimed more at kids than adults, though adults may still find a few of the exhibits fun. Orange-shirted "Explainers" wander around to help. A shop on the ground floor sells toys, puzzles, magic sand, chemistry sets and the like. There's a self-service pay-at-the-till cafe called Revolution on the ground floor; seating is mostly at long communal tables with chunky individual stools. Example prices as of January 2010: tea £1.50, coffee from £1.75; 250ml Juice Republic lemonade £2.50. There's an IMAX cinema too (entry not free). Entry to the museum and most of the galleries is free of charge. Bags will be searched on the way in; they will ask about sharp objects, but they don't mind you bringing in bottles of water. Accessibility: Level access to get in, and lifts to all floors. Ramps rather than (or as well as) steps are used to join areas of differing height within each floor. Most of the galleries have plenty of room to move around in. The seating area in the Revolution cafe might be a little tight for a wheelchair, depending on how full it is (the stools tuck under the tables). There's more accessibility information on their website. Getting here: There's an well-signposted underground walkway from South Kensington Station which comes out just to the north of the museum's entrance on Exhibition Road. Last visited by Kake and Richard, January 2010. Opening hours taken from the Science Museum website, July 2013. Last edited 2019-02-06 08:52:42 (version 3; diff). List all versions. Page last edited 2019-02-06 08:52:42 (version 3).